Product code: ES3142 Categories: Sold Items, Sold Watches. 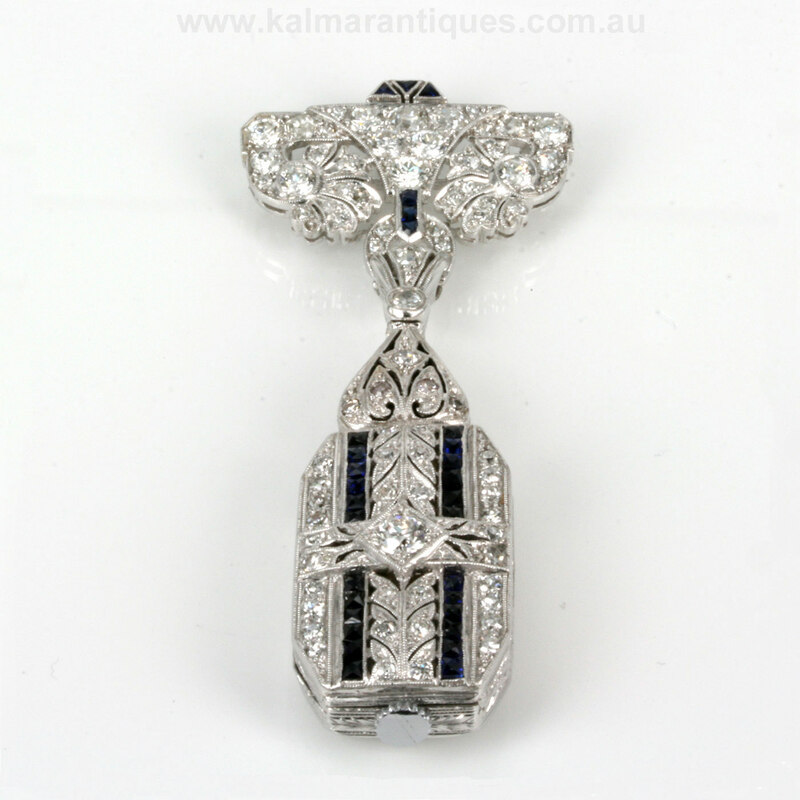 Here is a spectacular sapphire and diamond pendant watch that is just as much a piece of jewellery as it is a timepiece and is simply breathtaking to admire the fine intricate detail. Made in the Art Deco era of the 1920’s, the entire piece is made from platinum. 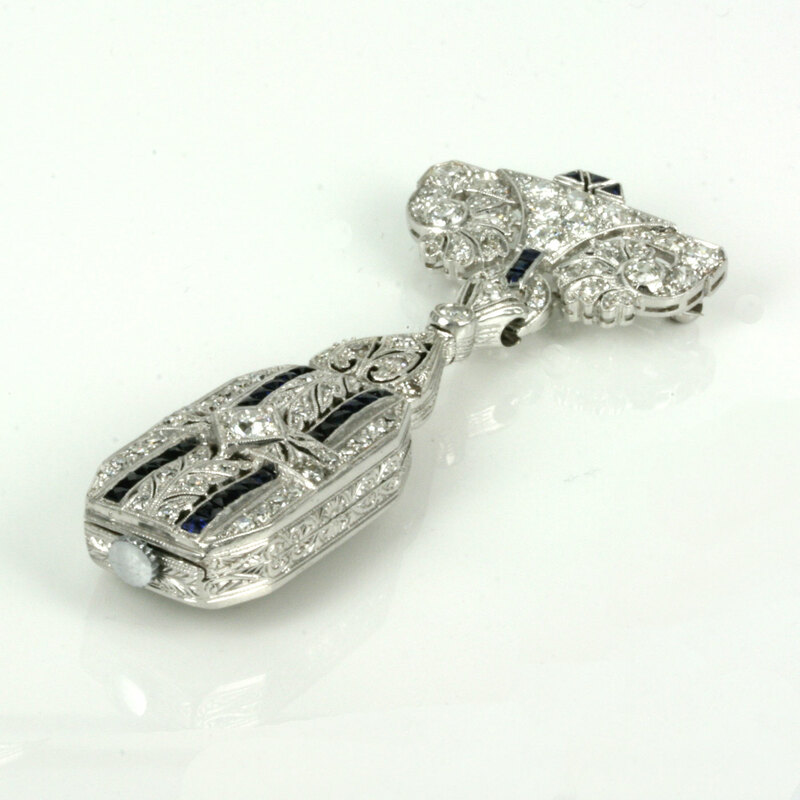 Platinum allowed this piece to be made with such fine work that allows the platinum to be worked in a way that creates not only the superb quality of craftsmanship as can be seen, but also allows it to be set with sapphires and diamonds. 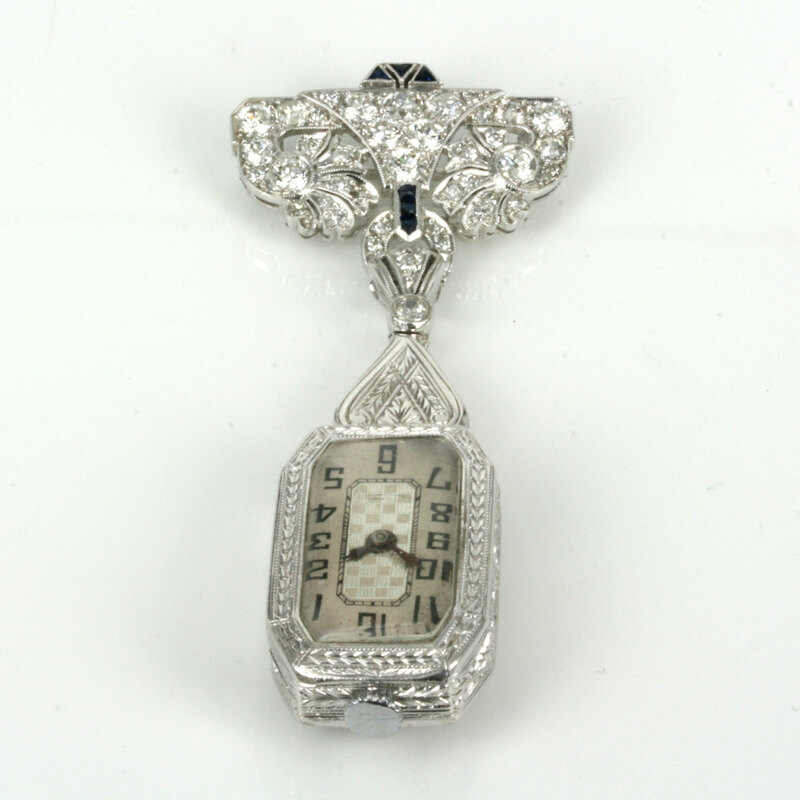 When this brooch is fitted, it can be worn with the front watch dial on display and pulled up to see the time or alternatively have the back showing all the fabulous detail. The watch bow is magnificently set with 6 sapphires and the watch with a further 24 sapphires. The sapphires total 0.62 carats and on the bow it is set with 38 diamonds and the watch case itself 40 diamonds. These diamonds total an impressive 3.97 carats and combined with the platinum and sapphires really make this a spectacular piece that truly stands out. 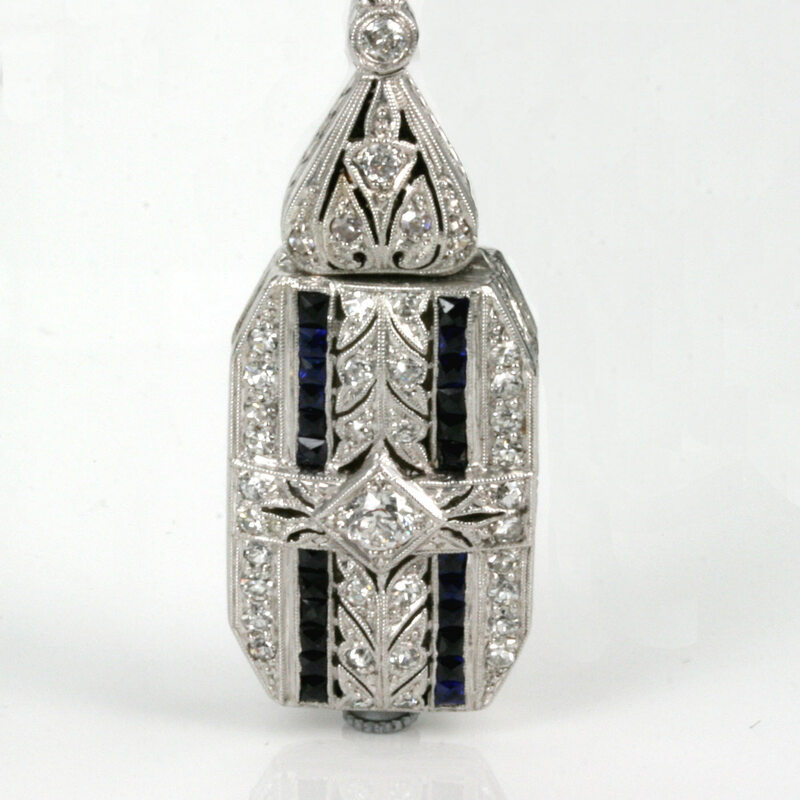 Like so much high quality Art Deco jewellery, it was not simply a matter of setting diamonds and sapphires in a piece, rather it was all the fine details and design that went into creating this work of art. The lovely pierce working is just extraordinary and will have you admiring it up close for hours on end. Not to be forgotten even the sides have been wonderfully and expertly hand engraved. Inside is a fully jewelled manual wind movement by Nerny Watch Co that has been fully serviced and comes with our 12 month warranty. Even the dial is so typical of the Art Deco period and still very easy to read. From top to bottom, it measures 6.6cm by 2.7cm wide at the top and 1.6cm wide at the watch. This is a fantastic example of high quality Art Deco jewellery that is destined to be admired every single time that it is worn.